Google has just soft-launched its latest browser experiment, the Google Body Browser, which is basically Google Earth for the human body. Think of it as a three-dimensional, multi-layered browser version of those Visible Man/Woman model kits. Or a virtualized version of Slim Goodbody, if you will. Google showed off the app at the WebGL Camp. WebGL is a cross-platform low-level 3D graphics API that is designed to bring plugin-free 3D to the web. It uses the HTML5 Canvas element and does not require Flash, Java or other graphical plugins to run. If you visit bodybrowser.googlelabs.com in a supported web browser, you’ll get a three-dimensional layered model of the human anatomy that you can zoom in on, rotate and search. WebGL support hasn’t hit mainstream browsers, but the beta versions of Google Chrome, Safari and Firefox all support it. Once you’ve got a compatible browser, visiting the Body Browser home page shows off the human body. You can adjust the various layers of skin, muscles, tissues and the skeletal system. What’s really cool is that if you type in an organ or bone or ventricle system, you are taken directly to that area in the anatomy, zoomed in. You can turn labels on or off and the app supports multitouch so users of trackpads (Magic or otherwise) or multi-touch mice can zoom in with ease. This is a pretty cool display of new web technologies. Presumably the use case is for the healthcare industry, but educators and students can benefit from this kind of demonstration too. Quick Pitch: Fake is a new browser for Mac OS X that makes web automation and testing simple. Genius Idea: Inspired by Apple’s Automator, Fake is a tool that lets web designers and developers create graphical workflows that can be run again and again, without human interaction. These workflows can be saved, shared and edited at ease. Fake is the creation of Todd Ditchendorf’s Celestial Teapot Software. Ditchendorf is the guy responsible for Fluid, one of our favorite single-site browsers. Whereas Fluid is a great tool that can appeal to a wide array of users, Fake’s target audience consists of developers, web designers or people that have to perform the same automated tasks repeatedly. That is to say, if you aren’t doing a lot of website testing, unit tests or debugging, Fake might not be for you. However, if you are a web designer or developer, Fake is just awesome. I’ve been using this app for the last month or so and I have to say, the ability to create workflows to perform rudimentary tasks like capturing a screenshot or filling out a form or clicking on a link is just really remarkable. A common workflow I utilize is taking screenshots. Oftentimes when I’m writing a post, I’ll need a screenshot from lots of different sources. Rather than taking each screenshot individually, I can just enter in each URL into Fake and have it repeat the “capture screenshot” action for each site. That way, while I’m writing in the background, my screenshots are being captured and saved to a folder of my choice. For testing purposes especially, the fact that Fake has assertions, assertion failure handlers and error handlers makes it really powerful. It’s often hard to get a real sense of how a site or web app is going to perform under certain conditions. User testing is great, but it can be expensive and time consuming, especially if you need to test various alternating aspects of a site. The great thing about saving workflows is that you can modify or rerun the workflow against other content. So for people doing A/B testing, you can set up the same set of “fake” interactions for each version and compare results. Fake is $29.95, but you can download a free trial to see how you like the app. The trial doesn’t let you save workflows and limits you to eight actions at a time, but it’s a great way to determine whether you need this kind of app. Designers and developers — what types of tools do you use for unit or automated testing? Let us know. The battle between Oracle and Google over Android’s use of Java just got a lot more interesting. That’s because IBM has announced that it will be collaborating with Oracle to work on the OpenJDK project. This means that IBM will no longer be part of the Apache Software Foundation’s Project Harmony, the project that provides Android with the components it needs to run Java code. With IBM leaving the project, Harmony is basically dead in the water. Although Android wasn’t mentioned in the announcement, this is all interrelated to the Oracle lawsuit. Google responded to the lawsuit last week, claiming that Oracle, which got Java out of its purchase of Sun Microsystems, was acting in bad faith. Sun never made good on those assurances and when Oracle took over Sun, the new company wasn’t interested in sharing the TCKs, instead wanting to focus all of its efforts on the officially sanctioned open source Java implementation, OpenJDK. This is a big blow to the Harmony project and by extension, to the libraries and classes that Android implements from Harmony in Android. Without big backing like IBM behind the project, it’s not likely to survive. For now, the Harmony implementation of Java is fine. The problem will be when future versions of Java are released and Harmony can’t keep up in terms of features. We think it’s because Google wanted to do an end-run around Sun’s licensing requirements. In essence, getting to take advantage of Java SE on mobile devices (something that Sun explicitly forbade without a license), but not having to pay for it. Long before Sun’s sale to Oracle, others pointed out the potential licensing and IP quagmire that Google was entering with Android. The reality was, Sun didn’t have the power, the funds or the industry clout to really do anything about it. Oracle does. In fact, Oracle’s clout and power is underscored by IBM’s decision to join up. IBM may be making its decisions for pragmatic reasons, but in the decision shows that IBM is not willing to side with Google in this elongated fight. At this point, Google’s only real recourse is to sensibly settle and pay Oracle, or countersue and drag the fight out even longer. By fighting back, Google risks alienating its Java-base of developers. While we question how important having a strong base of Java developers really is to Android’s success in the long term, it doesn’t mean it’s worth risking the future developments of the platform on a legal gamble. This is the “Moon” website or page from the Lost World’s Fairs website project designed by Jason Santa Maria. 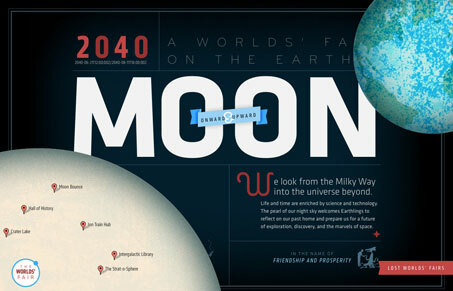 I love this design for “Moon”, the visual depth is really nice. I also love the movement as you scale your browser window down and then back up. The little illustrations are sweet too. It’s really hard to believe this is done with web fonts. The world of web fonts and web typography is exploding. After years of struggle, we’re finally at a point where using real fonts on the web is a viable option. For web designers, this is huge news because it means a greater degree of control over how content is displayed. For end users, it means a richer web experience. Thanks to web services like Typekit, Fonts.com Web Fonts, Webtype and others, the opportunities to integrate real fonts on the web is getting better all the time. Let’s look at five of the biggest trends taking place with web font and web typography design. The Web Open Font Format, or WOFF, is edging ever closer to becoming the de facto standardized format for using fonts on the web. Jason Santa Maria and his Friends of Mighty built Lost World’s Fairs as a way to showcase IE 9 and its support of WOFF. This fantastic piece of typographic web art really shows just how great type can be made to look on the web. When Adobe announced that they were partnering with Typekit back in August, it was a big move. Historically, the biggest font foundries have led the resistance against getting fonts on the web. Adobe’s decision was followed recently by the new company, Webtype, a partnership of Ascender, Roger Black and Font Bureau. Similar to Typekit, Webtype offers a way for designers or end users to get high quality fonts for use in their own designs. Last week, Monotype Imaging formally launched Fonts.com Web Fonts and brought many of the most famous Monotype, Linotype and ITC font families to the web. At this stage, nearly every major foundry is either offering fonts with web usage licenses or is considering making their fonts usable on the web. Eighteen months ago, that wouldn’t have been a reality. Today it is. When creating the Lost World’s Fairs project, Friends of Mighty realized they would need to have a way to better control individual letters and words to offer proper spacing and better kerning. As Dan Rubin recently remarked on Twitter, Lettering.js may just end up having a bigger impact on typography on the web than anyone is expecting. Fonts.com Web Fonts service and Typekit both offer support for multiple mobile browsers. This continues to increase as more and more mobile browser makers support various aspects of @font-face and draft specifications like WOFF. It’s not just enough for fonts to look good on the desktop, as more and more web usage shifts to the smartphone, having readable, legible and properly spaced typography on mobile devices will be a bigger and bigger area of interest. Already companies like Monotype and Typekit are working to make sure that fonts look their best on a number of different screen types and sizes. One of the most interesting recent advancements in the web font world has been the ability to choose web fonts when customizing an aspect of a web app. Thanks to Typekit and Google’s Web Font Directory, it’s easy for developers to build these tools into their product. Already many Tumblr themes are coming with Typekit support and new web services like About.me give users the option to customize their typefaces for various aspects of their profile. This is a great use of typography on the web because it gives end-users direct interaction with fonts and lets them see directly how different fonts look together and at different sizes. Web typography is on a tear and we’re at the beginning of a new era of a more beautiful, more legible and more customizable web.